LONDON, ENGLAND.- The BBC, Hotbed Media Ltd, producers of the BBC1 series Star Portraits with Rolf Harris and County Hall Gallery are delighted to announce the launch of a special Touring Exhibition of celebrity portraits from the first two series. 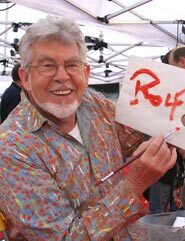 'Star Portraits with Rolf Harris', which first screened January 2004, features well known faces painted by professional portrait artists. Last year a similar exhibition at the New Art Gallery in Walsall attracted 84,000 visitors. Showcasing all 24 portraits created for the series including Cilla Black, Michael Parkinson, Mo Mowlam, Charlie Dimmock, David Dickinson, Richard Wilson, Adrian Edmondson and Meera Syal  this exhibition premieres at County Hall Gallery, London, on 25 May before touring the UK. BBC's Adam Kemp, Commissioning Editor, Arts, Music and Religion, said: The first series regularly engaged over five million viewers in the art of portraiture  a significant achievement and testament to both the programmes inventive format and the enduring appeal of Rolf Harris. One of the key functions of the BBC is to raise awareness, foster debate and create a new forum in which the public can interact with art. This exhibition vividly illustrates this role. Other venues for the exhibition include the New Walk Museum and Gallery, Leicester and the Naughton Gallery at Queen's University of Belfast.The second series of Star Portraits with Rolf Harris can be seen on BBC One at the beginning of June 2005. Art 36 Basel - "Artists Books"
Art 36 Basel - Art + Film = "Art Film"